Full size images of the beautiful illustrations in The One O'Clock Miracle to use on big screens. Together with the hardback story book these images allow you to read the story while showing the pictures on a large screen so that everyone can see them. Perfect for use in groups with children aged 3-6 years old. Simply add to basket and the link to download will appear in your confirmation email upon purchase. The One O'Clock Miracle is based on the healing of the official's son in John chapter 4. This wonderful storybook will teach children about the instant power of the words of Jesus, and that they should trust Jesus because he is God's Son. Stunningly illustrated by Catalina Echeverri, author and illustrator of several bestselling children's books, including Monty's Christmas, as well as the first two storybooks from The Good Book for Children, Alby's Amazing Book and The Christmas Promise. Written by Alison Mitchell, author of The Christmas Promise and several of our children's tracts. 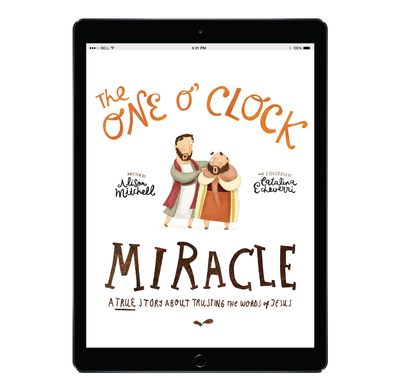 Wonderfully narrated and beautifully illustrated, The One O'clock Miracle is a compelling retelling of a famous Bible story of faith, grace and big, powerful words. I have this theory that people are more open to truth when they are smiling than when they are frowning. And Catalina Echeverri’s illustrations for Tales that Tell the Truth just make me smile! They are bright and winsome and shot through with humor. Combined with texts that faithfully retell both individual Bible stories and God’s Big Story, they make for a winning series of picture books. What a great book for kids (and for the adults who read it to kids)! Alison has captured the journey of the anxious father, desperate to find Jesus for his dying son. The story turns on the words of Jesus, "GO your son will live!” Alison’s use of repetition in her story and Catalina’s beautiful illustrations work together to capture the heart of this story from John 4. One of the perks of writing a blog, is that occasionally you land a little opportunity to review an absolute gem of a book. "It bought a smile to my face and joy to my heart." I stumbled across The Friend Who Forgives at my local bookstore yesterday & was absolutely THRILLED to discover it! I bought it, went home & looked up the illustrator, & after looking through them online, ordered 5 more of her books, including this one. I have been telling my friends & family about them & bought some as gifts as well. Why? Because I have never seen kids books that so clearly, creatively, & Biblically tell bible stories, while also accurately teaching the message of the story! (& I’ve seen lots!) The oldest of my 4 kids turned 4 this week & I am super thankful to have found these books in time to read over & over to my kids as they grow! THANK YOU!! !